Milky spore disease (Paenibacillus popillae) kills the grubs of Japanese beetles, but generally doesn't affect other insects. You can buy the disease-causing bacteria to apply to your lawn to get rid of Japanese beetle infestations. You can buy it at garden centers or hardware stores, as well as at online garden supply companies. 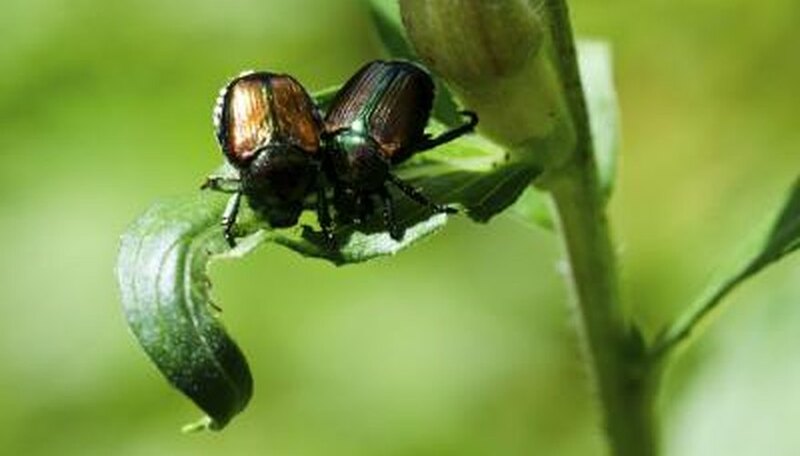 Japanese beetles are attracted to more than 300 types of plants and can severely damage them by eating the leaves and flowers. They lay their eggs in the ground and the larvae, or grubs, feed on plant roots and organic matter in the soil. The bright metallic green beetles have copper-colored wing covers, and two rows of tufts of white hair on their abdomens. The grubs are white and curl into a c-shape when disturbed. Make sure you have Japanese beetles before you treat. Apply milky spore powder to lawns at a rate of 10 ounces per 2,500 square feet, or as directed on the label, in spring or fall when the grubs are active. Water the area after applying the powder. Once a grub eats the milky spore bacteria, it will contract the disease and die. The disease develops best when the soil temperature is between 60 and 70 degrees Fahrenheit, and may take more than three years to provide effective control in cooler climates.